An article published in CityLab today identified the most expensive zip codes in the country, based on median home values supplied by Zillow. The most expensive zip codes are in the places you might expect. Of the top 10, three are in the San Francisco bay area (including San Jose), three are in Los Angeles and two are in New York. Boston and Miami had one each. What about Kansas City? We have some relatively expensive zip codes here in the metro, but they would fall well down the list. To crack the top 10, zip codes had to have a median home value above $2.7 million, and we don’t come close to that. According to the census bureau, the most expensive zip code in the Kansas City metro is 66211 (in Leawood and Overland Park, just south of I-435) with a median home value of $488,600. Of the nine zip codes with a median home value higher than $300,000, seven are in Johnson County. Of those, five hug State Line Road. 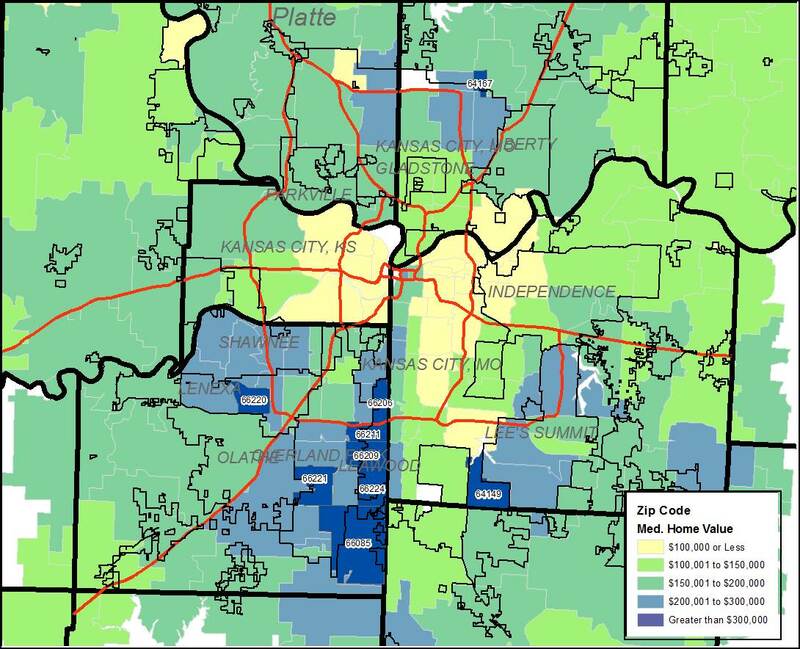 So, why the disparity between Kansas City’s wealthiest zip codes and the super-rich zip codes in these other metros? Part of the explanation is that housing just costs more there, as illustrated in the table below. The median home value in Kansas City is $156,000. This is the middle value, meaning that half of the homes in the metro cost more and half cost less. Picture a typical $156,000 KC-area home in your mind — maybe an average split-level with three bedrooms and a two-car garage. That same house would cost four times as much ($624,000) in San Jose. But home prices are really just part of the story. The top 10 most expensive zip codes in the nation are not made up of your typical neighborhoods, to say the least. These are places where the super-rich tend to cluster together in communities filled with extravagant homes. As the wealthy get wealthier, the demand for housing in these exclusive areas rises, and so does their median home value. And to the super rich, the location may matter more than the cost. Greater Kansas City may not have a particular zip code that people will pay a premium to live in, like 90210 — number three on the national list, by the way — but, compared to most other metros, we can afford a lot more house for the money. We’re a lower-cost metro and will probably never have any zip codes that crack the top 10 most expensive list. But we won’t have to figure out how to pay a $4,000 monthly mortgage on a median income, either.